Veteran local newspaper publisher Sir Ray Tindle is bowing out of the day-to-day management of the company he founded and handing over to his son. 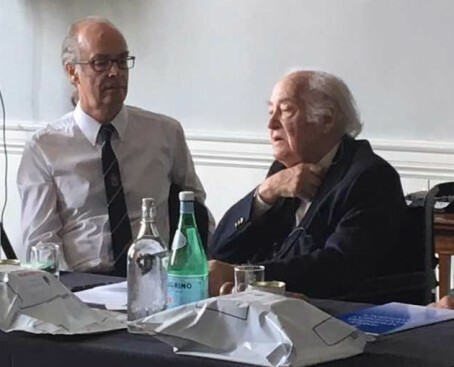 After more than 60 years in the hot seat, Sir Ray announced that his son Owen Tindle has taken on the chairmanship of Tindle Newspapers following the group’s top management conference last week. Sir Ray, who celebrated his 9oth birthday last year, will continue to serve as the company’s president. Announcing the succession at the conference in Oxon Heath, Kent, Sir Ray thanked Owen “for all you and your colleagues have done these last months and years”. Sir Ray said: “I must apologise for my absence recently through a series of illnesses and I must sincerely thank all the many people who have pulled me through and all those marvellous people who have pulled our papers through these recent troubled times. “I also thank my son Owen and say how pleased I am that as of now Owen becomes Chairman of the Tindle Group. Thank you Owen for all you and your colleagues have done these last months and years. In response, Owen thanked his father for “giving me this new revered position”. “It is a great honour to be passed the baton of the family company which I will carry forward for many years to come I’m sure. I’m so glad that you are staying on as President and more importantly as our esteemed guru. “Yours is a hard act to follow – an impossible act to follow, for you have created and built this group into one of the finest independent local newspaper groups in the country. “And you yourself must be the most accomplished and respected local newspaperman in the entire industry. He added: “No-one else has created and maintained such a successful and entirely family-owned group, remained in profit for over 40 years without incurring one penny of debt to anyone. “No-one else has remained so steadfast for so many decades through all the hard times and against such an array of adversaries, and carried themselves with such dignity, integrity and good humour. Not had the good fortune of meeting Sir Ray but always find myself agreeing with virtually everything he says. He’s a proper ‘newspaper person’. As he says, there will always be a need for ‘names, faces and places’. He’s always kept his finger on the news pulse. Good luck to Sir Ray and his son Owen.